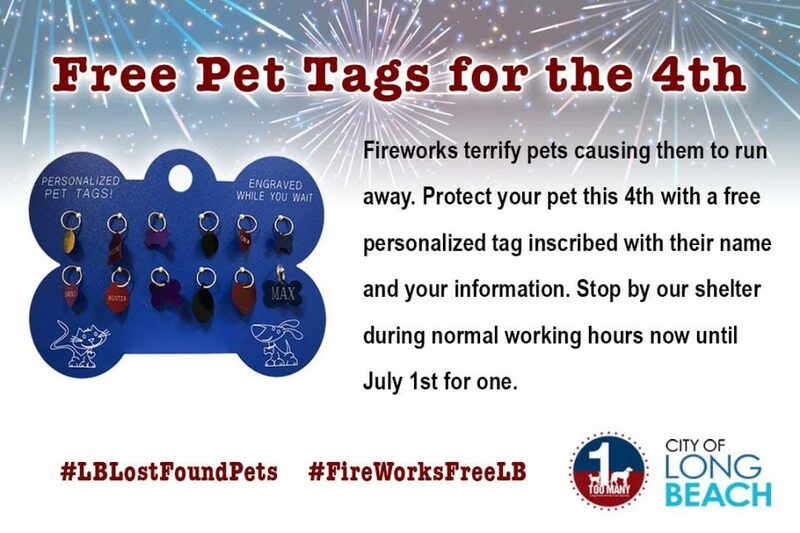 Graphic by Long Beach Animal Care Services. Can you foster a doggie for a brief period? If so, please email the shelter’s Foster the Fourth team at [email protected]. What we could politely call the silly season but want to dub something less civil has descended everywhere. It’s when people grab up fireworks both “safe” and unsafe and set them off everywhere. The legal displays of fireworks that are managed by professionals also produce shrieking, whirring, clanging and whistling terrors that thrill many of us but send others ducking for cover. All of it, particularly the stuff that has nothing to do with patriotism except for the rockets’ red glare and bombs bursting in air, disturb our peace of mind, freak out military veterans, and send pets screaming into the night. Dogs and cats can’t figure out what the heck is going on, and they’re dealing with an enemy that they can only hear, so they run. The lucky ones end up in shelters; those who aren’t so lucky get injured or killed by traffic or cower somewhere until someone discovers them. During this time, the staff at city shelters, including our own, are busy looking for the owners of the frightened pets or the ones found hurt or lifeless in the streets. 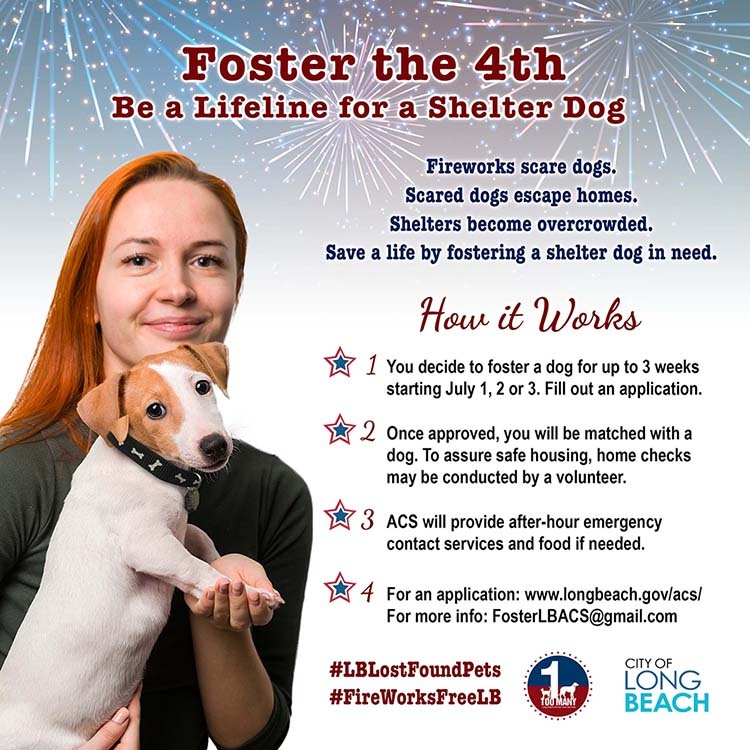 In the last Pet Projects, Long Beach Animal Care Services’ Foster the Fourth program was introduced—or reintroduced, since the shelter had one last year. Sencha and Earl Grey are two apparent siblings—a mix of German shepherd and husky. They’re social and friendly, and they’d love to have their own tea party at your house for a few days. Or forever. Video by ACS. Kucenas said that other shelters with Foster the Fourth programs also focus on dogs. Last year’s program was done in tandem with Live Love Animal Rescue (of course, that’s not to say that anyone can’t politely request a cat—never hurts to ask); this year, three independent volunteers stepped up to manage the program. Long Beach rescuers Patty Naughton and Deborah Turner along with India Griffin of Los Angeles-based FAR (Foster Adopt Rescues) Side Journey are working in tandem with shelter management and staff to help make room for the doggie deluge. ACS is at near capacity, so as the staff is working hard to return pets to their homes, the Foster the Fourth team is seeking out homes to temporarily accept the dogs who are already in the shelter. Fosters will welcome the pets for about three weeks, which will open kennels and runs for the visitors and prevent having to euthanize for space. Turner, who authored the popular Wheely Willy children’s book series, is both invested in finding fosters and actively participating by taking in five small dogs. Turner and Naughton became involved with Foster the Fourth when they approached ACS in the hope of starting a foster program there. Griffin’s involvement came out of her attendance at the Austin Pets Alive group meeting. APA is a private nonprofit dedicated to end euthanasia of Austin dogs and cats who could otherwise make it alive out of a shelter. APA’s innovative programs have attracted shelter management and staff from across the country to learn about their programs, and ACS was there as well. On recommendation from APA, who spoke highly of the shelter staff and its need for resources, both financial and human Griffin met with Kucenas and Shelter Director Ted Stevens, and Foster the Fourth was rolled out. As a community member, you can help by fostering a pet. Three weeks would be the approximate length of time you’d be hosting an Airedale bnb, and hopefully, you’ll fall madly in love and adopt the animal—not that there’s an ounce of guile here. To repeat, if you can help or know someone who can, please contact the team at [email protected]. Provide a safe place for your pet (inside the house is vastly preferable) with food, water and plenty of toys. Turn on a radio or TV. Boarding is an option as well as long as it’s a secure, calm location. Finally, do not take your pet to enjoy a fireworks display. It’s guaranteed that a good time will not be had.